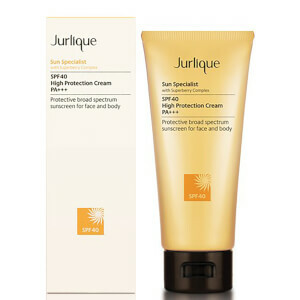 Experience the ultimate in sun protection with Jurlique Sun Specialist Spf40 High Protection Cream, an award winning sunscreen that works to protect your face and body from the damaging consequences of sun exposure, including the visible signs of ageing. The broad spectrum sun lotion offers the ultimate in UVA and UVB protection, combining soothing shea butter and essential fatty acids with a superberry complex to help protect your skin, deliver vital minerals and intensely moisturise. Skin will feel smooth and hydrated with this luxurious protective veil. For both men and women. - K.N. Apply liberally to dry skin 20 minutes before sun exposure. Reapply every 2 hours or after towel drying, swimming or perspiring. Active ingredients (%w/w): Octyl Methoxycinnamate 7.5, Butyl Methoxydibenzoylmethane 3.0, Octocrylene 2.75. Contains: Phenoxyethanol, Chlorphenesin, Sodium Dehydroacetate, Benzyl Alchohol. Ingredients: Aqua (Water), Phenoxyethyl Caprylate, Acrylates/Vinyl Neodecanoate Crosspolymer, Glycerin, Ethylhexyl Methoxycrylene, Diethylhexyl Syringylidenemalonate, Glyceryl Stearate, VP/Eicosene Copolymer, Cetearyl Alcohol, Myristyl Myristate, Sodium Stearoyl Glutamate, Plukenetia volubilis Seed Oil, Butyrospermum parkii (Shea) Butter, Palmaria palmata Extract, Ascophyllum nodosum Extract, Fucus vesiculosus Extract, Porphyra umbilicalis Extract, Coriandrum sativum (Coriander) Extract, Chamomilla recutita (Matricaria) Flower Extract, Rosa gallica Flower Extract, Glycyrrhiza glabra (Licorice) Root Extract, Viola odorata Extract, Viola tricolor Extract, Sambucus nigra Flower Extract, Camellia sinensis Leaf Extract, Cucumis sativus (Cucumber) Fruit Extract, Tasmannia lanceolata Fruit Extract, Syzygium leuhmanii Extract, Kunzea pomifera Fruit Extract, Fragrance/Parfum*, Silica, Acrylates/Beheneth-25 Methacrylate Copolymer, Xanthan Gum, Sodium Stearoyl Lactylate, Tocopherol, SD Alcohol 40-A (Alcohol Denat. ), Sodium Phytate, Caprylic/Capric Triglyceride, Phenoxyethanol, Ethylhexylglycerin, Chlorphenesin, Sodium Dehydroacetate, Benzyl Alcohol, Sodium PCA, Sodium Hydroxide, Limonene*, Linalool*, Citronellol*, Geraniol*, Farnesol*, Citral*.